Farmers markets provide direct access to fresh, healthy local food, benefiting farmers and consumers across the country. The Farmers Market Promotion Program (FMPP) is a competitive grants program intended to increase and strengthen direct producer-to-consumer marketing channels. FMC is committed to documenting and sharing the program’s innovations and maintaining strong federal support for FMPP in the upcoming Farm Bill. FMPP was established in the 2002 Farm Bill in order to “establish, expand, and promote direct producer-to-consumer marketing and assist in the development of local food business enterprises,” and first began funding projects in 2006. The 2014 Farm Bill expanded the program into the Farmers Market and Local Food Promotion Program (FMLFPP) and authorized two subprograms – FMPP and the Local Food Promotion Program – to receive $15 million in annual funding. Both programs are administered by USDA’s Agricultural Marketing Service (AMS). The 2018 Farm Bill merged the FMLFPP program with the Value Added Producer’s Grant (VAPG) to form a new program known as the Local Agriculture Market Program (LAMP). While the underlying programs remain largely the same the merger provides baseline funding which offers a measure of security and stability for the future of the program. One notable change to the FMPP grants is the requirement of a 25% match provided by the applicant. FMPP grants must are available to assist direct-to-consumer outlets (i.e. farmers markets and roadside stands) develop, improve, and expand operations and to provide outreach, training, and technical assistance to these direct-to-consumer businesses. Eligible applicants include non-profit corporations, for-profit businesses, agricultural cooperatives, producer networks and associations, local governments, public benefit and economic development corporations, regional farmers market authorities, and tribal governments. Grants can be used for a variety of projects including market startup, infrastructure, training and education, outreach, market analysis and planning, customer and producer surveys, vendor and customer recruitment, and new venue establishment. Awards range from $50,000 to $500,000. FMPP attracts a wide variety of local, regional and state-level applicants with interests ranging from health to economic development to food security to sustainable agriculture—many of which have not sought or received USDA grants before. 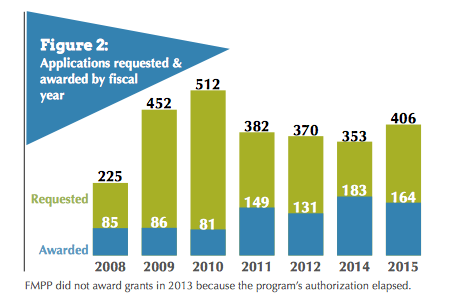 Since 2006, 21% of all proposals have been funded, with community demand for the program consistently outweighing available funds. Market organizers—often limited by volunteer staffing—juggle many activities simultaneously, including coordinating with farmers, curating an appropriate product mix, conducting outreach, securing permits and planning educational programming. FMPP was established by Congress to help direct-to-consumer outlets like farmers markets attain self-sufficiency and provide economic and social benefits to both rural and urban communities. The resources required by these nonprofit community organizations to get started and implement innovative programs are typically small. Research suggests that with a small and targeted infusion of funds, markets can become stable, identify and leverage community partners and resources, facilitate volunteer staff, and establish viable operating and governance models that help local farmers compete in an increasingly sophisticated retail environment. Research by FMC and Market Umbrella revealed that FMPP grants yielded a diverse set of impacts in hundreds of communities, serving and even helping build the capacity of statewide farmers market and direct agricultural marketing organizations. Grantees reported that after receiving their grant, the variety of local farm products sold, the number of vendors, and the number of consumers all increased substantially. Get Ready for the 2019 National Farmers Market Poster Contest!